Downtown Lee’s Summit is no stranger to the pub crawl. They’re done for holidays and birthdays. They’re held to raise money for charity. And sometimes, they’re done for no good reason at all. That raising money thing? That was the motivating force for two downtown Lee’s Summit business owners — Courtney Laufketter of Budget Blinds and Julie Kemna of Konrad’s Kitchen and Tap House. The pair picked a recognizable and respected nonprofit — Hope House — as their charity of choice and put an enjoyable spin on a holiday musical classic. The combination of an entertaining, well-named event (12 Bars of Christmas) along with the modest ask of $10 per lanyard equaled a first-year event in 2014 that brought in more than $2,000. The buzz immediately began to grow. The rousing success brought awareness to Hope House, its organizers and to our downtown entertainment district. “Are there really 12 bars in downtown Lee’s Summit?” was a common question. And, at the time, the answer was yes. Plus a few more. Fast forward to 2018, with nearly 20 tavern-like establishments, and the event has rebranded into the 12ish Bars of Christmas. But the name change is only one small part of the evolution that has occurred with this event. In 2017, the organizers boldly ordered 2,500 lanyards, skyrocketing past totals, all of which sold. Nearly $50,000 has been raised in four years and organizers ordered another 2,500 for this year. As with any successful fundraiser, volunteers are vital to delivering the end result each year. Scores of people give their time to the 12 Bars event, manning the doors at each stop and taking in additional donations for Hope House. It’s become a well-oiled machine that takes a committee to execute — donations, logistics, volunteers, planning — and has earned accolades for the organizers and recognition in the region as fundraiser that has changed how we approach raising funds for nonprofits. As she should. Courtney has endured quite possibly every curveball you can imagine at the annual event, including when power went out in a handful of bars the first year due to a squirrel getting into a transformer. Rallying the bars and organizing a fundraiser where truly 100 percent of the proceeds go to the nonprofit is a feat in and of itself. 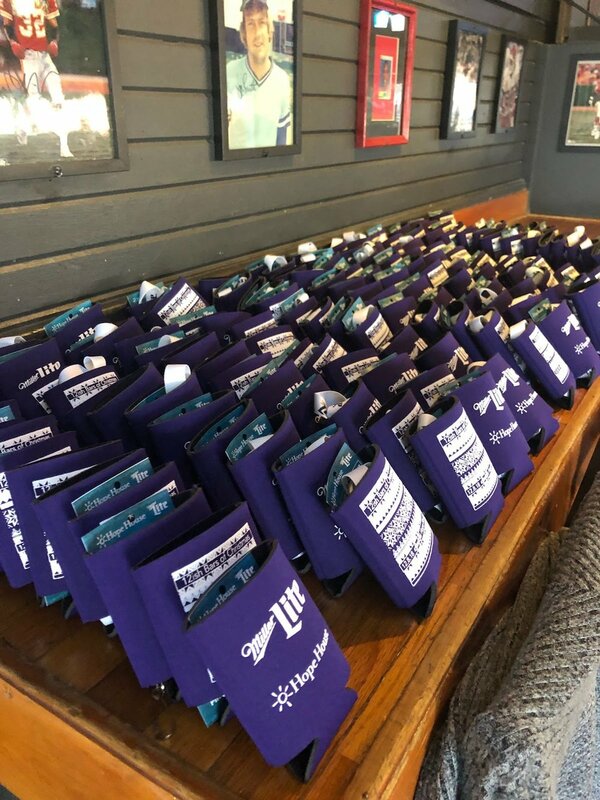 Even if you plan on just hitting one pub for a drink on Saturday, Dec. 8, buy a lanyard and show what the amazingly giving spirit in downtown Lee’s Summit continues to look like.